Life With the Ladniers: Happy 10 Months, Logan! Happy 10 months, sweet boy! Logan is going to be walking on his own VERY soon. 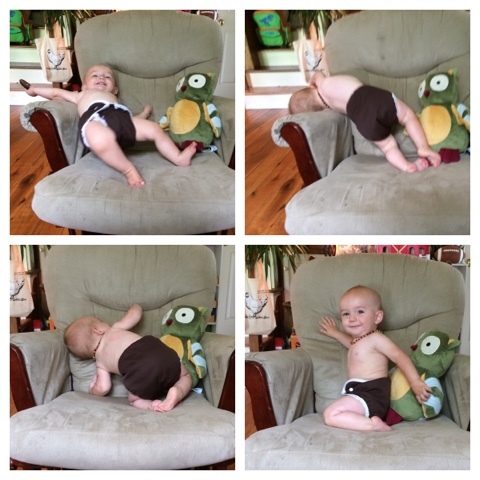 He can push up to standing without holding on to anything and has taken up to 5 steps (never for the camera though!). He loves music and will sit and play in the music center in their playroom for a very long time. He has started shaking his head though has not *yet* learned to pair the action with "no." We think he just likes the sensation. 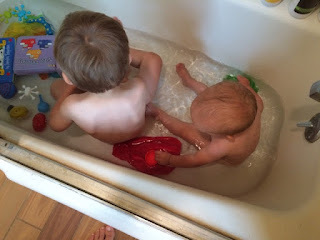 He has started mimicking us a lot so we are thinking he will start reproducing the signs we have been showing him for the past few months (eat, more, all done, bath, water, etc). That will be a welcomed development for sure! 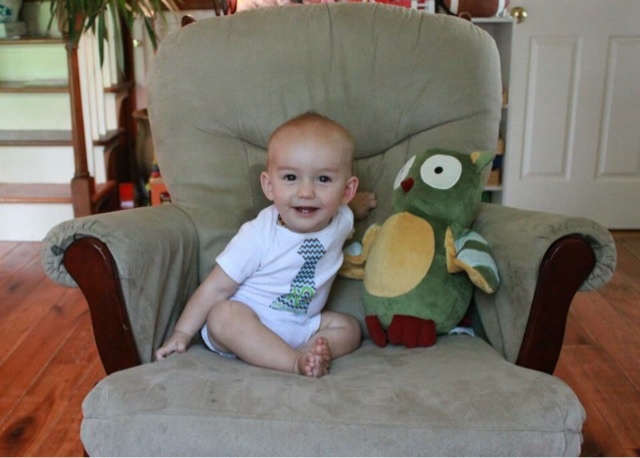 Read about Logan at 9 months here! He still loves anything water related and is fascinated by all of this rain we have been having. He has started pointing to things which is adorable. He can point to our noses when we ask him to and will reproduce animal sounds for a cat hissing, a pig snorting and a lion/dinosaur roar. His interest in books has been picking up recently and he has started bringing one to us every now and then, wanting us to read it to him. He is able to turn the pages of his board books. His gross motor control is coming along nicely. Along with his emerging walking skills, he has also learned to climb the stairs, the dishwasher door and up into the refrigerator when it is open. He is obsessed with the dog's food and water and we pull him out of that room regularly. He is very curious and persistent which means he is all over the place and into everything. He cannot explore or get his hands on enough. This is both equally wonderful and exhausting :). Logan is our early riser. He gets up between 6:00 and 6:30 unless we had a really big day prior after which he may sleep in an hour or so. He still sleeps in the bed with me so I can nurse him in my sleep. This sort of multitasking is right up my alley. He simply adores Ayden and the feeling is mutual. 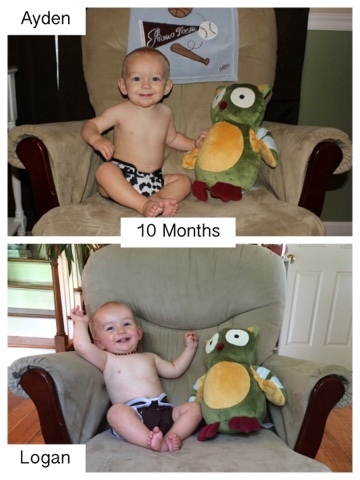 Read about Ayden at 10 months here! 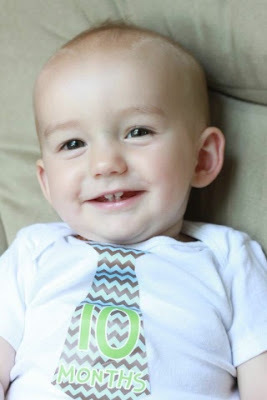 Logan's face lights up when Ayden wakes up in the morning or after a nap and rejoins the fun. This age is wonderful because of all of the intentional affection that is developing. Logan is SUCH a cuddle bug! At the same time, though, it can be cray-zy. He is such a happy boy, he will let anyone hold him and his smile is contagious. He really brings our little family so much joy. Flashback! Here's what we were up to one year ago today: "Toad Motel"
Two years ago today: "We Miss Daddy!" And three years ago today: "Rock N Roll"
My daughter also co-sleeps with me and she nurses while I sleep too. I did the same with my mom. Typical nursing babies. Wonderful and exhausting.